So I saw a post the other day about an organisation that makes pamper bags for mums with kids on the spectrum. They were looking for people that made cards- hoping to get a few donations of cards for these bags. Being a parent to 2 boys on the spectrum I really loved this idea. It was perfect for me because I love making cards but find I have nothin to do with them once I make them. I have lots of fab stamps sets I like to try out. I send cards to the Cards for Troops organisation at Xmas and Mother's Day for the same reason. I sent a message and signed up. I'm happy that my cards are going to a good cause. And one I have personal experience in. So that is what I have been doing for the past few days. And so far, this is my fave card. It's using the Stampin Up! Lotus flower set- fantastic! 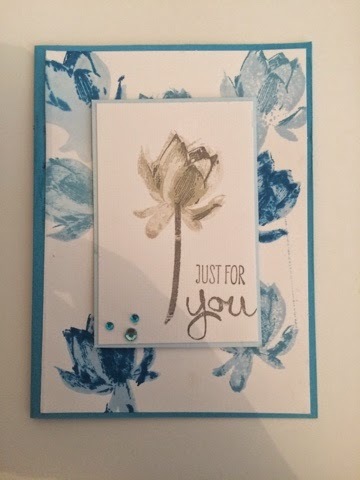 I actually made the backround when I was testing out the stamp set and trialing out colour combos. It looked so cute I couldn't waste it so I turned it into a card. And I love it.